Arizona Biking Laws You May Not Know | Phoenix Personal Injury Law Blog - Breyer Law Offices, P.C. Most cyclists in Arizona try to bike as safely as possible. But they could be breaking some rules of the road for bicyclists and not even know it! Generally, the same rules of the road that apply to motor vehicles apply to bicycles as well. This means that bicyclists must always pay attention to traffic signals and signs and obey them. Cyclists also must signal when they are turning, and they must yield the right-of-way when another motorist or cyclist has it. Cyclists and motorists both must operate their vehicles as close to the right-hand side of the road as possible when moving slower than other traffic. Cyclists in particular should travel as close to the right-hand shoulder as they can, provided it is safe to do so. This means that cyclists cannot travel in the middle of the right-hand lane as motor vehicles can. While cyclists may follow many of the same guidelines and laws as motor vehicles, there are some laws that apply to cyclists only. Arizona law ARS 28-813 states that every bicycle must have a standard bicycle seat attached to it that allows the rider to sit on it. Most bicycle manufacturers provide this type of seating, and cyclists may not change it for something that is not considered safe and standard. Cyclists may not remove the seat completely from their bicycle either. Many cyclists break this law when they choose to give someone else a ride on their bicycle, a practice commonly known as “doubling.” Unless the bike was specifically made for two people, and therefore has two separate standard seats, doubling is also against the law. Cyclists may not remove the bicycle’s handlebars either, and they must hold on to the handlebars with one hand at all times while riding the bike. ARS 28-816 is an important law to know, as many cyclists like to let their arms and hands hang down at their sides, or perform some task while riding that requires both hands. But this practice is against the law. Arizona law ARS 28-814 states that no bicycle can be attached to a vehicle on the roadway. Nor may a cyclist hang onto another vehicle while that vehicle is on the road. On other words, no towing bicycles behind cars. While many cyclists believe that they must ride single-file at all times, this is not actually the law in Arizona. But cyclists should not ride with more than two people side-by-side, according to ARS 28-815. When on designated bicycle paths throughout the state, groups of cyclists may ride side-by-side. Although not against the law, Arizona recommends that cyclists try to avoid riding at night, as this is a much more dangerous time for cyclists. But it is the law that cyclists who choose to ride at night must equip their bicycles with a white light on the front, and reflective lights on both the front and rear of the bike. 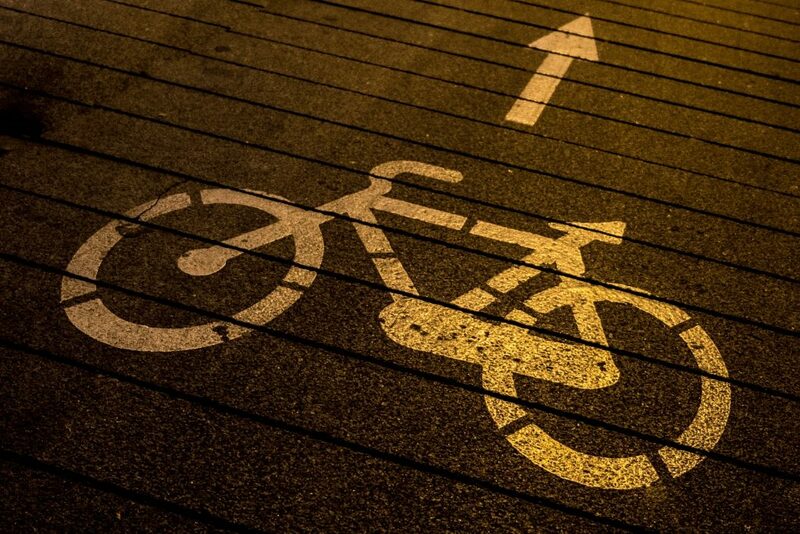 There are some rules of the road for cyclists that cause confusion. This confusion comes from the fact that different cities enact their own bicycle bylaws, so what may be legal in one city may not be in another. The two laws that are most often confused in Arizona surround the use of bike helmets and bicyclists riding on sidewalks. Throughout Arizona, no one over the age of 18 is required to wear a bicycle helmet. And only three cities – Tucson, Sierra Vista, and Yuma – require cyclists under the age of 18 to wear bicycle helmets. These helmet laws for minors are also applied in Pima County. While riding bicycles on sidewalks is prohibited in Tucson, it is largely acceptable in other major cities around Arizona. However, many of these cities also post signage prohibiting the use of bicycles on certain sidewalks and these signs must be obeyed. If you’re a biker who loves to take in Arizona’s beautiful scenery, always remember to review the rules of the road before you head out, so you can keep yourself and those around you safe during your journey. Most cyclists want to follow the rules of the road, and most obey the traffic signals and laws that apply to them when they go out to enjoy a bike ride. However, not all car drivers do the same. If you were hit by a motor vehicle while riding your bike, our Arizona bicycle accident attorneys may be able to help. Call (602) 267-1280 for a free consultation at Breyer Law Offices, P.C.